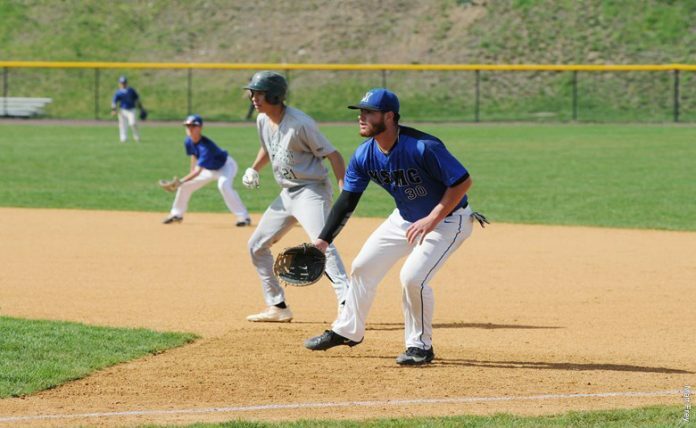 The Mount Saint Mary College Baseball team saw its season come to a close on Friday with a pair of losses in the Skyline Conference Championship. FARMINGDALE – The Mount Saint Mary College Baseball team saw its season come to a close on Friday with a pair of losses in the Skyline Conference Championship. Tom Huvane homered in an 8-3 loss to St. Joseph’s-L.I. and senior Christopher Introcaso drove in three runs in a heartbreaking 9-8 loss to the United States Merchant Marine Academy. The Knights got on the board first in the opener when Huvane drilled a one-out home run to left center field to put the Knights in front 1-0. The Golden Eagles answered right back in the home half of the inning when Daniel Campinelli singled through the middle to bring in Anthony Raucci to knot the score at 1-1. St. Joseph’s grabbed its first lead of the game with two runs in the fifth when Lou Doria plated a run with a sacrifice fly and Tyler Costa scampered home on a wild pitch to put the Golden Eagles in front 3-1. Mount Saint Mary got off the mat in the sixth to tie the score at 3-3 with three straight hits to start the inning. Anthony Rizzo singled to start the rally and scored a batter later when John Santana tripled to right center field. Santana was delivered on an Introcaso double that evened the score. The Golden Eagles responded again in the home half of the inning and grabbed the lead for good with two runs in the six, a single run in the seventh and two more in the eighth to pull away for the win. The eventual deciding came home on a throwing error with Tyler Crafa adding a run scoring single in the sixth. Six different Knights finished with a hit against St. Joseph’s with Introcaso and Kevin Edgar doubling, Santana tripling and Huvane homering for the for the first time this season. Rizzo, Santana and Huvane all finished with a hit and a run scored. Jake Stewart took the loss and fell to 3-4 overall on the season with 6.0 innings of work. He allowed three earned runs on six hits and struck out three. Anthony Papa worked a complete game for St. Joseph’s, allowing six hits and fanning four. The Knights scored five runs in their first at bat in the initial elimination game of the weekend and later led 8-4, but a four run seventh completed the comeback for the Mariners and advanced them to their second elimination game on Saturday. Mount Saint Mary strung together four hits in the top of the first with Introcaso doubling home the first two runs and Chris McLaren driving in a run with a single. Jack Goodwin picked up an RBI when he was hit with a pitch with the bases load. After USMMA plated a run in bottom of the first, it got three runs in the fourth to pull to within 5-4. Jesse Reinbold and Reilly Cherry each recorded run scoring base hits in the inning for the Mariners. Mount Saint Mary spread its lead to 8-4 with three scores in the top of the sixth, taking advantage of two hits and a pair of errors. Santana singled home Goodwin and Introcaso drove in his third run of the game with a sacrifice fly before Steven Mirra came home on a two-out error. The Mariners got a run back in the home half of the sixth and then rallied with four runs in the seventh to pull in front for good. With two outs and the bases loaded, Reinbold cleared the bags with a triple and scored on an outfield miscue to put the Mariners in front 9-8. The Knights put the tying run in scoring position in the ninth, but couldn’t get the game even. Santana and Introcaso each finished with two hits in the game, with Introcaso pushing his team lead in RBI to 37. Mirra scored twice for the Knights with Nick Rizzo and Goodwin also posting a hit and a run scored for the Knights. Santana suffered the loss on the mound, working 6.2 innings for the Knights. He allowed five earned runs on 10 hits and struck out two batters. Andrew Hunt earned the win in relief, working the final 4.0 innings and allowing just one hit. Friday’s losses finish the Mount’s season at 22-12-1.